Welcome! 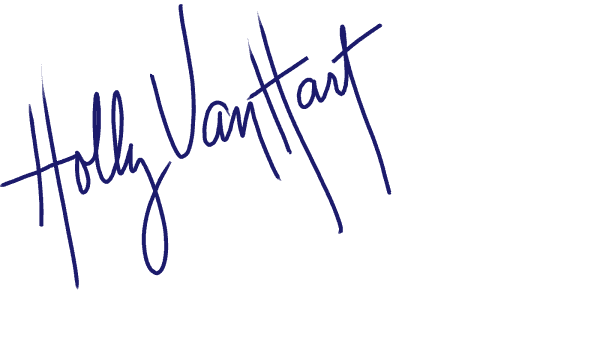 My name is Holly Van Hart, and I am an artist who is fascinated by the limitless opportunities we have in our lives. In my abstracted nature paintings, the fullness of nature is used to symbolize abundance and the generation of new life and new ideas. My work is exhibited internationally. It has been awarded solo exhibitions at the Triton Museum of Art, University of California San Francisco, and Stanford University, and has won Grand Prize at the California Statewide Painting Competition and Best of Houzz. 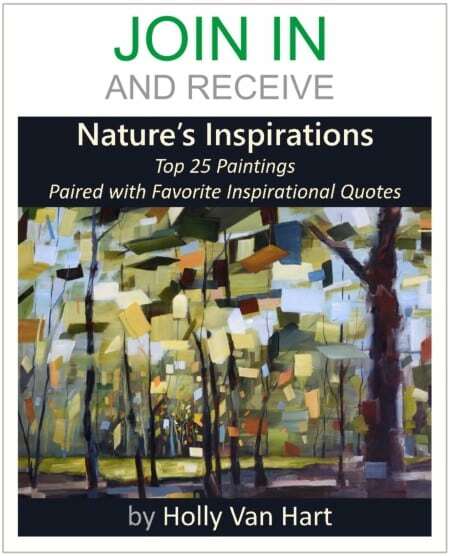 Fine art galleries across the United States represent my paintings. They have been added to the collections of CxOs and top executives of LinkedIn, Oracle, PwC, Roche, Adobe Systems, Hewlett Packard, Cisco, Google, Airware, Xilinx, Texas Instruments, Silver Lake, TCV, Stanford University and more. The Huffington Post, Professional Artist Magazine, Mercury News, Examiner, Saratoga News, Santa Clara Weekly, KTYM Los Angeles Live Radio, Silicon Valley ‘Talk Art’ TV, and Best of Houzz have all featured my paintings. Each day in my studio is an exciting and on-the-edge exploration of ideas, feelings, subjects, paints, textures, and colors. When starting a painting, I know what I want to convey and have a general idea of what the finished work will look like. Each painting is a journey, requiring many layers of paints, and much inspection and introspection over a period of months. Typically, I paint subjects found in nature and abstract them with unusual colors and unexpected textures. Using multiple photo references, I sketch the composition onto a blank canvas. Then I build up the painting using 5-10 layers of paint, waiting days or weeks between each layer for the paint to dry. The layers are critical to achieving desired colors and textures, and they give the painting a special glow. The unusual colors and textures in my work are meant to help us see nature in new ways and with new wonder. When a painting might be finished, I ask myself ‘Is this a museum-quality painting?’ The finished work rarely looks exactly like what I first envisioned. But by the time it is done, I have learned a tremendous amount about the subject and myself, and have earned the satisfaction of creating a unique piece of art. * I am fascinated by other cultures and exploring new places. For business and pleasure, I’ve traveled in 40 countries and all 50 of the United States. From camping in Costa Rica, to living with a family at a Buddhist temple in Japan, to RV’ing across the US with my husband and sons, to many months of business trips and amazing meals in Italy, to backpacking in Asia and Africa for 6 months, I loved it all. * Whether traveling or at home, I am an avid hiker and mountain biker. I’ve also had many memorable experiences with kayaking, white water rafting, rock climbing, hang gliding and bungee jumping. * I am fueled by chocolate. The darker the better. Other foods are optional. * My very favorite thing in the whole world is being with friends and family.